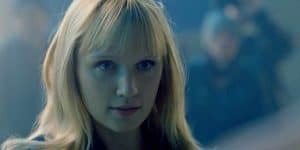 Humans Season 3 on the Way from AMC in 2018 | Nerd Much? AMC and Channel 4 have announced that their sci-fi robot synth drama Humans will get a third season. Season 3 will make its debut in 2018 and will have eight new episodes. Production for the new season will begin this fall, with many of the show’s cast returning. For those unaware, Humans follows the tale of the rise of sentient robot servants (called synths in the series) and their quest to be treated as humans. It’s an obvious social commentary about equality, and it’s one of our favorite series running right now. Humans stars Gemma Chan, Katherine Parkinson, Emily Berrington, Tom Goodman-Hill, Lucy Carless, and more, and it was nominated for Best Drama Series at last year’s BAFTA Awards. Season 3 will see the return of series creators Sam Vincent and Jonathan Brackley, who will write the new season. It will be executive produced by Vincent and Brackley as well, alongside Derek Wax and Emma Kingsman-Lloyd. If you haven’t yet given Humans a chance, we highly suggest you do so; it raises a lot of interesting social issues worth discussing, and it does so in a way that isn’t overbearing or cheesy. For more on the latest in sci-fi TV, stay tuned to Nerd Much?.